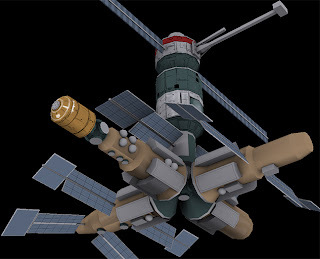 I was quite daunted by the prospect of texturing the MIR space station. The texture page is quite complex and is quite slow to look for the bits you want to paint and guess the result, specially when making panels. I have been looking at a tool that allows me to paint straight into the 3d model. Viewport Canvas lets me do just that. I am just blocking out the panels and although the result is quite crude, I can use this as a guide to make the final texture much quicker.